This Cape Buffalo hunting package in Zimbabwe features 10 Days walk and stalk hunting in a Zimbabwe Lowveld Reserve! The herd size in this reserve is over 300 strong. 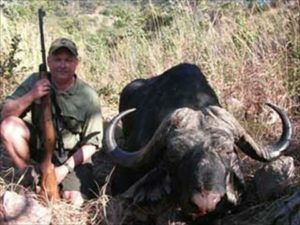 You can be sure of hunting a hard-bossed cape buffalo bull or dugga boy. This hunt is with one of Zimbabwe’s top PH’s and in one of the most renowned classic reserves of 20,000 hectares. This is an excellent opportunity to hunt a large herd with a great PH in a comfortable camp. This lush reserve is less than 3 hours from Bulawayo and easily accessible by road transfer with our PH. Additional plains game and other dangerous game species available as an add-on. Zimbabwe produces excellent cape buffalo year after year. If you’re looking to hunt in a remote forest wilderness, with one of Zimbabwe’s top PH’s this is a great safari for you. This hunt includes accommodation, all trophy fees, licenses, guide fees and transportation from Bulawayo airport to the camp and return.